Hard to choose so we picked quite different but all very stylish from Roland Mouret first ‘New In’ the unique Asterleigh dress a cool combination of black blended mesh with a pretty flocked fern design on the front bodice, flamboyant bell sleeves an asymmetric peplum waist works perfectly over a bias-cut A-line skirt giving an overall high-fashion-gothic look. Then from the Exclusives Collection, there’s the stunning deep purple, figure-hugging Featherstone Gown draping and strappy. The Allerston dress from the AW17 Collection a great anytime anywhere dress fluid silhouette, hammered satin softly draping from neckline complete with draping peplum from waist falling just below the calf, 100% silk (possibly a personal fave). Then wouldn’t this one look perfect for a red carpet style occasion the Denby Gown a yellow and white brocade cotton/silk dress with polyamide lining, ooh nice. Clearly, all are show stoppers which one fits your personality and what occasion do you wish to dress up for. 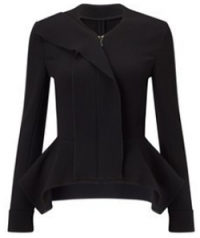 Also loving these wear me anywhere jackets as a ‘Posh Me Up’ ‘Cover Me Up’ or ‘Warm Me Up’ love the Burgess Jacket strappy off the shoulder style asymmetrical front button fastening, fitted waist a flattering shape. 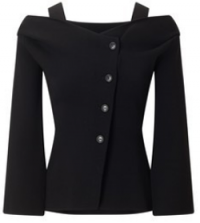 The Lavenden Jacket shown in black crafted from 100% wool with 100% cotton lining a feminine cut emphasising the waist with a nipped in cut and flowing peplum handkerchief hemline. 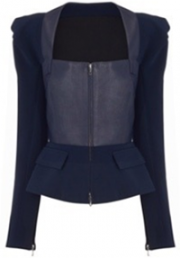 Plus the gorgeous new limited edition Galaxy Jacket crafted in navy blue leather and stretch viscose, flattering peplum waist and finished with silver front bodice and sleeve zips. 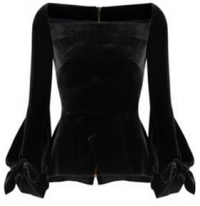 Or choose separates whether a top for special occasion paired with a perfect skirt this was the most difficult to choose a few faves but here we go first the gorgeously fitted black Wicklow Top from the Showstopper AW17 collection this one 18% silk, 82% viscose and 100% silk lining. 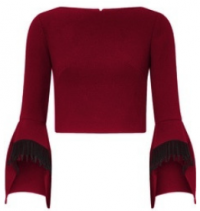 The sumptuous Liverton Top shown in claret with black rustic laced fluted sleeves. Adding a sense of Provence, France said to be Roland’s major influence on the latest collection wears well with the high waisted skirts and trousers (also in other colours). 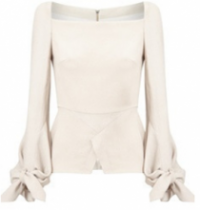 Love the ecru Wicklow Top too needed to be shown as well, in acetate and viscose with 100% silk lining. Skirts glorious skirts all lengths and must-haves pencil skirts and maxi skirts, skirts to show off those moves in. 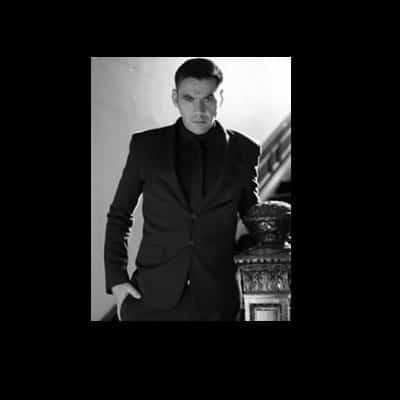 Whatever the style that flatters you these are beautifully cut – more to choose from too. First up on the left from the Pre-Fall 2017 Collection the Shenley Skirt a floor-length viscose crepe a beautiful flowing A-Line shape most flattering and comfortable. Followed by a deep navy blue Showstopper Haxby Skirt 18% silk 82% viscose with lining 1 100% silk and lining 2 viscose/acetate and elastane blend. Followed by The Lathbury Skirt 100% silk a showstopper soft flowing skirt. Last in the line-up the ever popular Arreton Pencil Skirt this one for AW17 Collection in black velvet with a little stretch crafted with exposed polished gold zip down the back seam for a great look for evening tone down with a crisp white shirt, or jazz up further with the Wicklow top shown above umm gorgeous. Don’t forget the footwear, make or break the look these are rather stylish from Roland Mouret first Hero II shoes in claret with 4″ heel or the Sophia Shoes peep toed and lace-up ankles in black two-tone leather and suede also shown in claret. Then pop your money, phone and lipstick in a bag and you’re ready to go – Roland Mouret style, we showcased the same Mini Classico bag in four shades black patent, yellow, blush, and claret. Now add a coat for colder days or nights we discovered from the Showstoppers the warm stylish Bexley Coat 100% wool acetate/polyester lining belted waist with draping asymmetrical wrap around the hemline. The Studham double crepe wool coat in blush also shown in black a 100% wool coat with 100% silk lining. Perfect to wrap up in or hang loose with an asymmetrical hemline and black rustic lacing to sleeve hem. 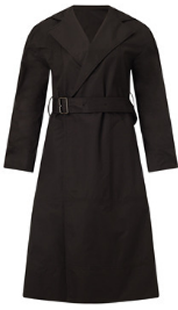 The Waddesdon cotton /polyamide black coat more of a French trench coat always in style. Please note this isn’t a paid advertisement. For more stylish Women’s Fashion Check our Women’s Clothing then Women’s Footwear and last but not least Women’s Accessories for shopping and inspiration online. Where we highlight equally beautiful clothing.